"Then the story went from being amazing, to incredible." Neon + CNN Films have debuted the first official trailer for an forgettable documentary called Three Identical Strangers, which won a Special Jury Prize at the Sundance Film Festival earlier this year. This gripping, jaw-dropping, shocking, mind-expanding film from director Tim Wardle was won of the most talked about docs at Sundance this year, because it's just so astounding. You just have to see it to believe it! The story goes that one day in the 1980s, three random strangers accidentally discover that they are identical triplets, separated at birth. They they get famous, but it's what they discover after all of that which will leave you jaw on the floor. A must watch doc - check it out. New York, 1980: three complete strangers accidentally discover that they are identical triplets, separated at birth. The 19-year-olds' joyous reunion catapults them to international fame, but it also unlocks an extraordinary and disturbing secret that goes beyond their own lives - and could perhaps transform our understanding of human nature forever. 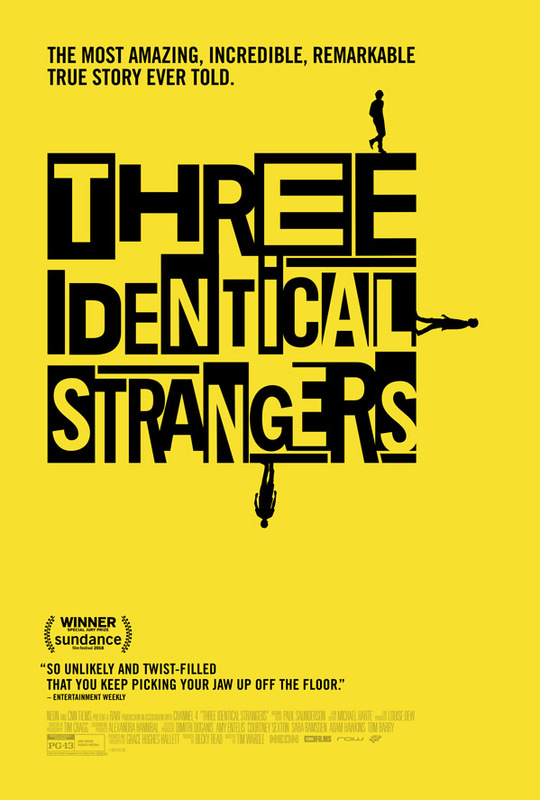 Three Identical Strangers is directed by British filmmaker Tim Wardle, of the documentary Lifers: Channel 4 Cutting Edge and One Killer Punch, as well as development work for leading UK production companies. This first premiered at the Sundance Film Festival earlier this year, where it won a Special Jury Prize for Storytelling. Neon will release Wardle's award-winning doc Three Identical Strangers in theaters nationwide starting June 29th this summer. Who's curious about this one?